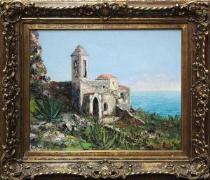 At Casa Carrie, we own a midcentury original oil painting of Italy's Amalfi Coast hanging in my office. Southeast of Napoli and due west of Sorrento, the Amalfi Coast is famous for the play of light between its Mediterranean sun and sea. In the afternoon, the interplay of direct and reflected sunlight makes the Amalfi Coast perfect for a juxtaposition of seascape and landscape. 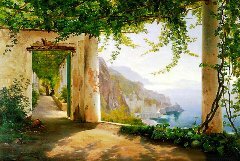 As I looked around our home, I realized that we have three separate pictures of the Amalfi Coast. The one mentioned above is the masterpiece, with its muted gilt frame, deep textures and sublime light. Adjacent to it is a framed print of a similar scene, painted from a different vantage point. The third is a small, sunny oil painting with lots of color and sailboats heeling in an afternoon breeze. With thousands of Amalfi Coast photographs available through Google Images, It was easy to determine that all three of our images are true to their location, including the headlands and coves that make up the Amalfi Coast. From different locations on the same hill, each artist captured a coastal settlement, clinging to a steep hillside in the middle ground. In each, far mountains come down to the sea, ending in a cliff or in a gentler slope, depending on the artist’s perspective. Although each scene is one that I would gladly place myself within, the C Proietto masterpiece is my favorite. At almost thirty-two inches wide by twenty-three inches high, its foreground includes the terrace of a classical villa. On the right is a long bench, with alcoves receding into its mortared structure. Above the stone bench is the azure blue water of the Mediterranean Sea. Dominating the center of the picture, and receding to the left are three great columns, two of which feature slender grapevines. The vines ascend to an arbor, culminating in a leafy crown. Showing a slight nicotinic haze from many years of exposure to cigarette smoke, our masterpiece still shows us gentle gradations of color, from the ocean to the sky. I now turn my head and view a wonderful depiction of both home and coast. For years, neither Carrie nor I could decipher the signature on our masterpiece. Painted across and into the rough texture of the painting, the artist's name looked more like machine characters at the bottom of a bank check. It seemed that the artist did not care if we could read his splotches of black paint. Or, because of his anticipated fame, he expected us to know who he was. Each night, late in his life, Pablo Picasso would sit at the same table in his favorite cantina. When tourists, who knew he might be there stopped in and asked for an autograph, he agreed to do so, but demanded $10,000 in cash for signatures often scrawled on the back of a menu or on his own bill for dinner. Soon tourist seeking an autograph from Picasso, brought sufficient cash with them to obtain their own original Picasso. Something tells me that most of those buyers were not disappointed with their bargain. Pocketing ten or twenty thousand in cash each night satisfied Papa, as well. Perhaps, CProietto expected to be known by his signature alone. One recent morning, Carrie deciphered the signature on our painting. As I awoke that morning, she said to me, "It's, CProietto”, as if I knew what she was talking about. She had been up early, Googling his name and quickly reaching a dead-end at the pay-for-play art database websites. Apparently, they have not yet discovered that data wants to be free. Perhaps they should check with Google for a new business model. 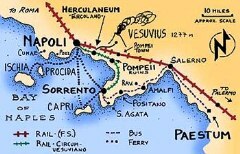 With our artist's name now known, I set out to discover (for free) more about this "Man of Amalfi", Signore C. Proietto. According to Google, there are two matches for the Google search, "artist+CProietto". Carlo Giuseppe Proietto is a contemporary Italian pyrographer of note. The other Costantino Proietto was born in Italy in 1900. According to a terse biography accompanying a German eBay listing for one of his paintings, "He was born in Catania, Sicily, studied at the Florence Academy under Professor Fernando Cappuccio. and lived in Italy". He is listed in the auction data bank ‘ADEC artprice’ under ‘Proietto’.” There are no visual images of the artist that are available on the internet, nor do we know his date or place of death. Despite an well documented body of work, CProietto, is not, as of this writing, included in the Wikipedia ‘List of Italian Painters’. Although most fine art catalog websites are available by subscription only, FineArtInfo.com publicly lists three CProietto paintings sold at auction since 2005, plus one that was unsold as of their posting date. Their prices ranged from $100 to $487. Aagaard’s painting includes the same terrace as our masterpiece, but emphasizes a field of view to the left of C Proietto’s. Costantino Proietto was born in 1900, five years after Aagaard’s death, so their paintings of the Amalfi Coast might differ in age by up to one hundred years. When we merge the edge of Aagaard’s image with that of C Proietto, they blend harmoniously. With the addition of Aagaard's view to the pergola, on the left, two separate images morph together in one continuous scene. To support provenance of both his art and the place, Aagaard later painted a perspective back to the terrace, from the far end of the pergola. For the first time we see, from that perspective, the precipice that we only feel in C Proietto's seascape. According to Aagaard's depiction, access to the terrace and pergola requires a walk up a long and arduous path, all the way from sea level to the summit of this "Angel's Landing" location. When I saw Aagaard's precipice for the first time, I felt a touch of vertigo; as if I had just been there. The well-defined edge of the terrace and the vastness of the Mediterranean Sea heighten the difference in elevation between the terrace and the sea. C Proietto's sublime terrace scene features a landscape view, while Aagaard features landscape view towards his vanishing point. When a master of the nineteenth century and a master of the twentieth century paint the same scene, from the same terrace, it raises as many questions as it answers. Together they answer the question, “Is this place real?” Aagaard's depiction of the place hints, but does not show that the classical villa exists. Left unanswered are questions about C Proietto’s knowledge of Frederik Aagaard and his earlier painting of the same scene. Since each painter includes the columns supporting an arbor above, we know that it is a central feature of the terrace. If one were to review Carl Frederik Aagaard's many variations on the one depicted here, C Proietto's scene varies in ways one would expect over a century of use. C Proietto includes a low fence between the columns. Did someone get too close and step off into the abyss, thus precipitation additional safety measures?. Since the terrace existed for parts of the past two centuries, might it still stand on that rocky precipice today? Before Aagaard or after Proietto, how many others have hiked that switchback path to sublime light and classical delight? 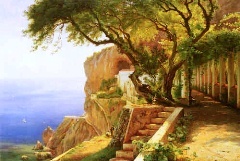 The internet image of Aagaard’s Amalfi Coast painting is too small for us to discern more than its overall artistry. On the far left of Aagaard's Amalfi Coast painting, his doorway to infinity tells us that he understood the concept of a vanishing point. Leaving these side mysteries for another day, I did not conduct further research into Aagaard’s other works or the prices that they fetch at auction. Costantino Proietto, on the other hand, we know as a twentieth century artist who combined both modern and impressionistic elements in his Italian seascapes and other water-related scenes. Costantino Proietto created lasting art that graces our home and perhaps many others around the world. The low auction prices that C Proietto oil paintings now command reflect his relatively unknown status, rather than the quality of his work. In my opinion, if he were better known, his paintings would be more highly prized than the $100 - $500 indicated by recent auction prices . Although we do not yet know his date of death, nor do we have a picture of him, we hope that this article will stimulate interest in both the artist and his works. Someone may read this article, walk into his or her study as I did, only to discover that their seascape is a C Proietto original, or maybe a Carl Frederik Aagaard original. In order for the world to appreciate Costantino Proietto as a great Modern Impressionist, we need more information about his art and his life. If any reader has additional images or biographical information to share, we would be happy to post it here. If you have knowledge that will help solve an ongoing twentieth century art mystery, please leave a comment at the bottom of this article or send your images via email. All information posted will include proper attribution, in accordance with the provider’s wishes.